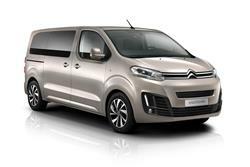 Find out everything you need to know on the new Citroen Space Tourer from independent vehicle review website Car And Driving. You can watch the video review to the left to see more of the car or read their written review below to get a true insight from an expert in the automotive industry. Citroen brings its first People Carrier aimed at families with their own private parking space outside the maternity unit. Jonathan Crouch checks out the SpaceTourer.